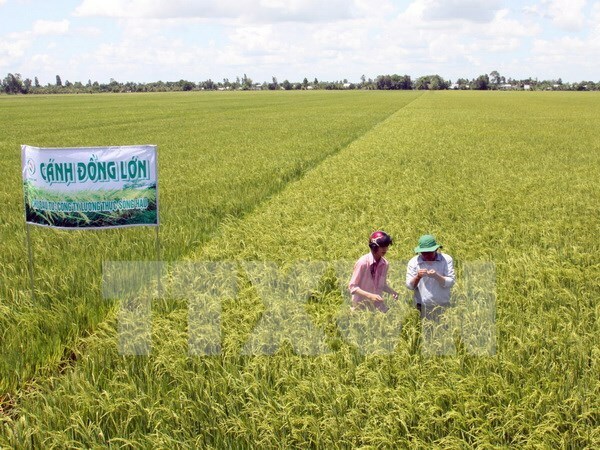 Ca Mau (VNA) - Nearly 9,000 farmers in southernmost Ca Mau province worked to produce 540,000 tonnes of rice on more than 10,760 hectares of large-scale paddy fields in 2015. The large-scale field is a centralised production model that utilises coordination among farmers, businesses, scientists and State agencies to facilitate the application of technology in cultivation, improving the value of agricultural products and farmers’ incomes. The model has enabled locals in Ca Mau to use greener technology, and deal more effectively with unfavourable weather and harmful insects. These efforts have led to lower prices and higher profits, with an average local household’s earnings reaching up to 20 million VND (900 USD) per hectare. According to Nguyen Van Tranh, Deputy Director of the Provincial Department of Agriculture and Rural Development, said productivity rose by between 15 and 20 percent, thanks to the model. Ca Mau will continue expanding these paddy fields throughout 2020 and calling for corporate support for farmers, Tranh said. Additional measures will also be applied to curb volatile prices, he added.